He insisted on starting two weeks in front of the others so that perhaps his death could secure the five demands and save their lives. The 1981 Irish hunger strike started with Sands refusing food on 1 March 1981. The significance of the hunger strike was the prisoners' aim of being declared as political prisoners (or prisoners of war) and not to be classed as criminals. The Washington Post, however, reported that the primary aim of the hunger strike was to generate international publicity. "We, the Republican POWs in the H-Blocks of Long Kesh, and our comrades in Armagh prison, are entitled to and hereby demand political status, and we reject today, as we have consistently rejected every day since September 14th, 1976, when the Blanket protest began, the British government's attempted criminalisation of ourselves and our struggle. Five years ago this day, the British government declared that anyone arrested and convicted after March 1st, 1976, was to be treated as a criminal and no longer as a political prisoner. Five years later we are still able to declare that that criminalisation policy, which we have resisted and suffered, has failed. If a British government experienced such a long and persistent resistance to a domestic policy in England, then that policy would almost certainly be changed. But not so in Ireland where its traditional racist attitude blinds its judgement to reason and persuasion. Only the loud voice of the Irish people and world opinion can bring them to their senses and only a hunger strike, where lives are laid down as proof of the strength of our political convictions, can rally such opinion, and present the British with the problem that, far from criminalising the cause of lreland, their intransigence is actually bringing popular attention to that cause. We have asserted that we are political prisoners and everything about our country, our arrests, interrogations, trials and prison conditions show that we are politically motivated and not motivated by selfish reasons or for selfish ends. 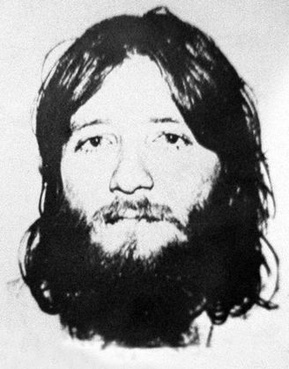 As further demonstration of our selflessness and the justness of our cause, a number of our comrades, beginning today with Bobby Sands, will hunger strike to the death unless the British government abandons its criminalisation policy and meets our demandfor political status." For the first seventeen days of the hunger strike Bobby kept a secret diary in which he wrote his thoughts and views, mostly in English but occasionally breaking into Gaelic. He had no fear of death and saw the hunger-strike as something much larger than the five demands and as having major repercussions for British rule in Ireland. The diary was written on toilet paper in biro pen and had to be hidden, mostly carried inside Bobby’s own body. During those first seventeen days Bobby lost a total of sixteen pounds weight and on Monday, March 23rd, he was moved to the prison hospital. 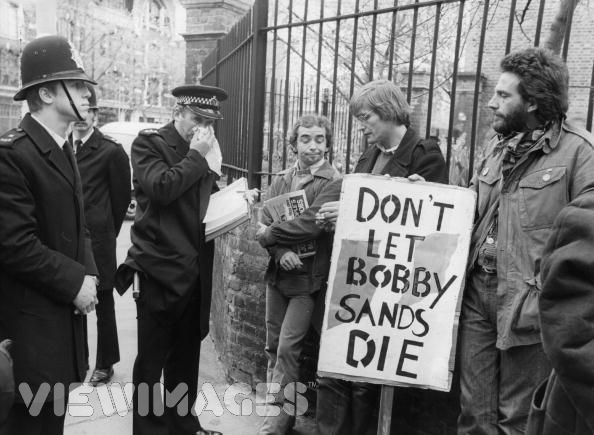 A policeman talking to IRA sympathisers bearing banners on behalf of the hunger striker Bobby Sands, during a May Day march at Clerkenwell Green in London.